For SPON Day on Saturday, December 8th, we'll be releasing 2018 SPON Three Year Blend, 2018 SPON Still and 2018 SPON Shiraz & Cabernet Sauvignon! 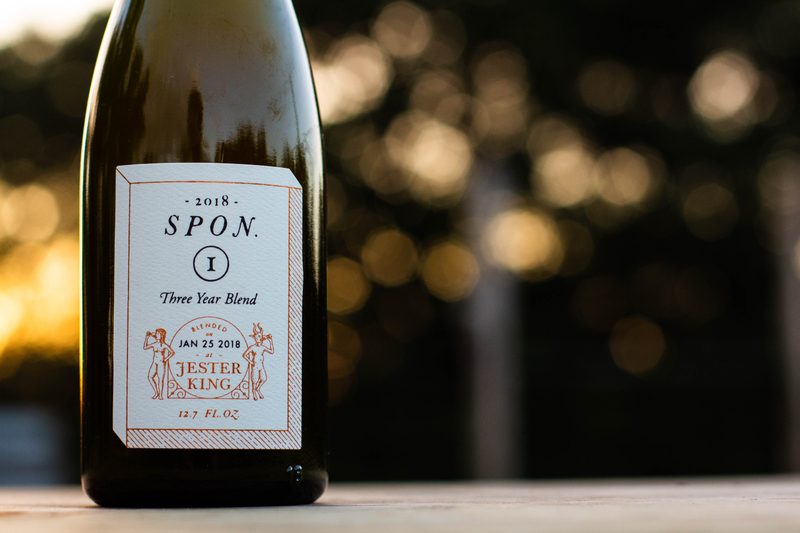 2018 SPON Three Year Blend is our blend of one, two and three year old 100% spontaneously fermented beer. Our goal is to honor tradition while making a beer unique to the Texas Hill Country, our winter microflora, and the people of Jester King. We brew with water from our well, grain from our local maltster (Blacklands Malt), old hops from the attic of our barn, and ferment with ambient yeast collected overnight as the wort cools in our coolship. We spontaneously ferment in oak barrels, blend across three years, and 100% naturally condition for almost a year in kegs and bottles resting on their sides. We made three separate blends for 2018. All three were composed of roughly 50% beer from 2017, 33% beer from 2016 and 17% beer from 2015. Each blend is right around 5.5% ABV and were packaged last winter. This is the third time we've released our SPON Three Year Blend following 2017 SPON Three Year Blend and 2016 SPON Méthode Gueuze. 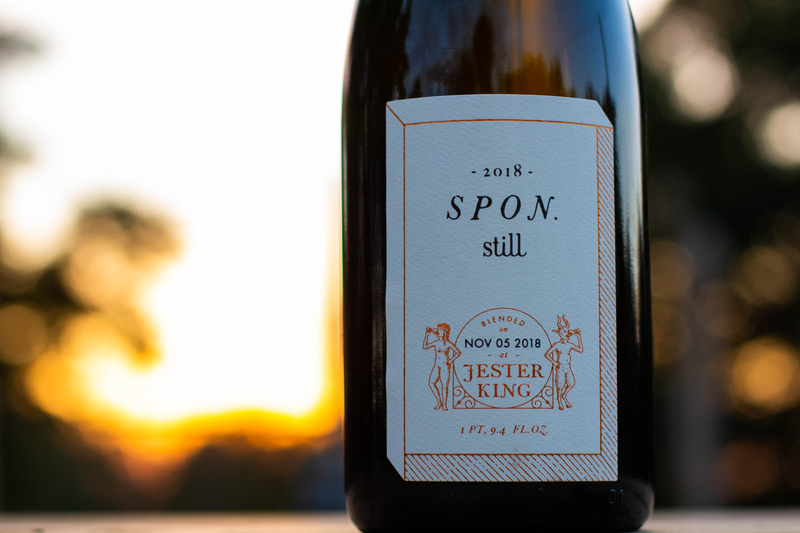 2018 SPON Three Year Blend will be available by the glass and in bottles to go (375ml/$20 and 750ml/$36) at Jester King starting at Noon on SPON Day (12/8). All combined, we have about 5,900 bottles available with a bottle limit of six per customer per day. We'll also be releasing 2018 SPON Still on Saturday! For SPON Still, we emptied a single barrel (No. 845) containing 20 month old SPON. We packaged it unblended and still (virtually no refermentation in the bottle). 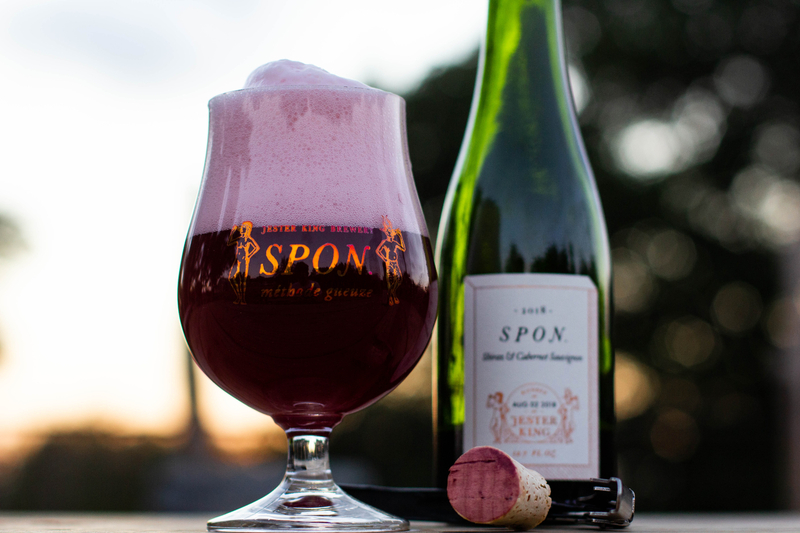 SPON still is inspired by unblended, authentic Lambic. 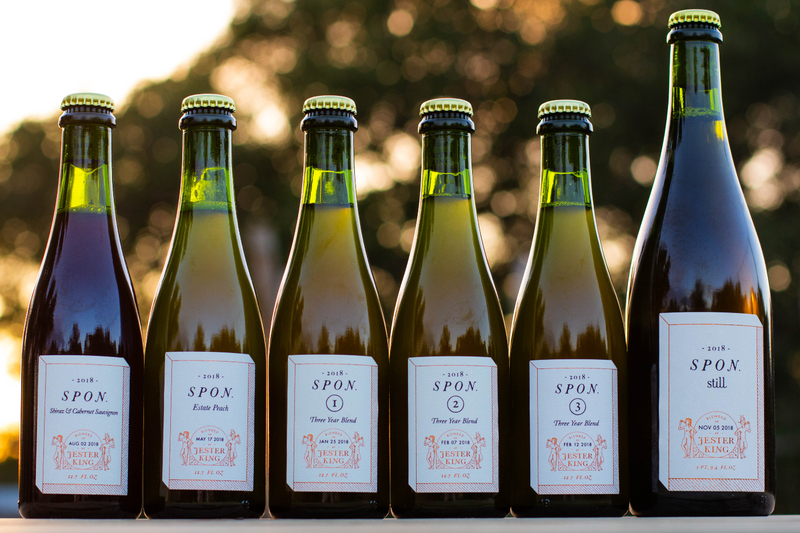 2018 SPON Still came from our fifth coolship season (winter 2017). It's about 5.5% ABV. It will be available by the glass (bottle pours) and in bottles to go (750ml/$25). We have about 500 bottles to go with a limit of two per customer per day. This is our third release of SPON Still following 2017 and 2016. Finally, our last new release for SPON Day will be 2018 SPON Shiraz & Cabernet Sauvignon! We blended 75% beer from 2017 that was about 20 months old with 25% beer from 2015 that was about three-and-a-half years old. The blend was then refermented with Shiraz grapes from Brenham, Texas and Cabernet Sauvignon grapes from Sulphur Bluff, Texas. 2018 SPON Shiraz & Cabernet Sauvignon is 7.6% ABV. It too will be available by the glass and in bottles to go (375ml/$25). We have about 2,800 bottles available with a bottle limit of three per customer per day. We hope you enjoy these three new SPON beers this Saturday on SPON Day!